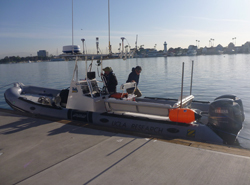 UCLA's new Research Vessel has been operational since March 2010. 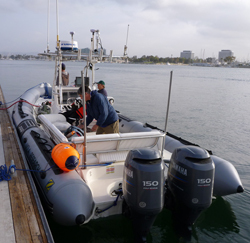 It is a 27 ft Zodiac that has been planned and outfitted by Burkard Baschek, UCLA. 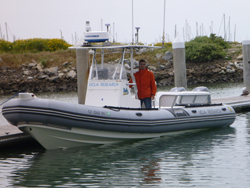 It is ideally suited for coastal research and measurements of small-scale quickly-evolving phenomena, such as submesoscale features, tidal fronts, or river plume fronts. 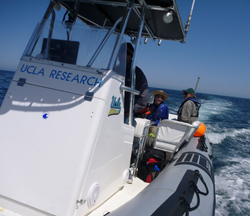 UCLA is member of the Southern California Marine Institute (SCMI), San Pedro, CA, and the Research Zodiac is operated by this consortium. For reservations and further information contact Tom Chavez at SCMI. 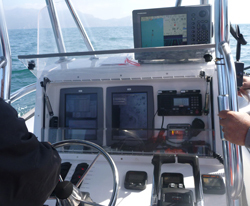 Length 27 ft Navigation 2D-GPS Hemisphere V110, Furuno Radar and Echo Sounder. 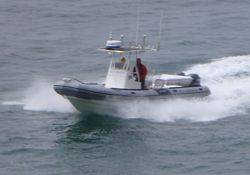 Speed 45 knots (10-15 knots for underway measurements) Communication 2D-GPS Hemisphere V110, Furuno Radar and Echo Sounder. Persons 8 + Captain (day use only) Equipment Slip-ring winch (inductive cable: 500m, 5mm diameter; speed: 1m/s), davit, on board computer, generator (12V/110V).